Botanical Beauty Monoi de Tahiti Oil is an extraordinary oil for face, body, hair, lip and nail care. 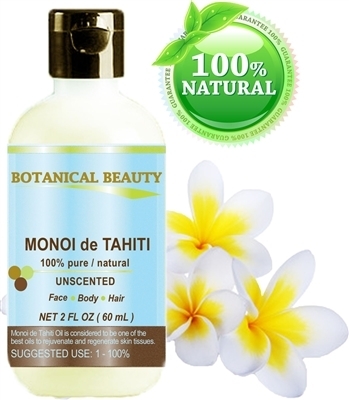 MONOI de TAHITI Oil 100% Pure 1 Fl.oz. - 30 ml. Botanical Beauty Monoi de Tahiti is an extraordinary oil for Face, Body, Hair, Lip and Nail Care. MONOI de TAHITI Oil 100% Pure 2 Fl.oz. - 60 ml. Botanical Beauty Monoi de Tahiti is an extraordinary oil for skin and hair care. MONOI de TAHITI Oil 100% Pure 4 Fl.oz. - 120 ml.